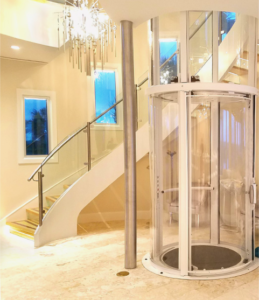 Residential Elevators – Vertical Transport Inc.
As land continues to grow more expensive as it becomes scarcer, houses are being built taller and home elevators are gaining popularity with older and younger homeowners alike. People who purchased their homes 10+ years ago are finding it less costly to install a home elevator than it is to move, while increasing the resale value of their home at the same time. For many years most of us believed a residential elevator was out of reach, that only the very wealthy could or should have one. We all just assumed we couldn’t afford an elevator in our home. In reality a residential elevator is extremely reasonable. Coastal homes will normally have the bedroom on a lower floor with the kitchen and family rooms on the top floors to capture the views. This, along with Federal Flood Regulations puts a lot of stairs between the street level and the family room, making a home elevator the perfect solution. Carrying a large or awkward item up and down the stairs could result in personal injury, damage to the home and/or to the item. With today’s rising healthcare costs, that simple fall on the stairs could end up costing you more than what you could have paid for the elevator. Don’t forget those injuries that occur outside of the home we all have, at one point or another, suffered from a strained muscle, a sprained ankle or worse; and that we were forced to climb the stairs one painful step at a time. The home elevator will allow the homeowner to travel safely and comfortably from floor to floor. The more accessible the home, the more appealing it will be to a wider variety of potential buyers. Many buyers walk away from a home they may have really liked because they are worried about their current or future mobility, or worse they may never even get out of their cars to tour it. If you can remove the accessibility objection, you will have increased the number of potential buyers; this is especially significant since a growing portion of the buying population is approaching or is in its ‘golden years’. Beyond the accessibility issue, many home buyers prefer the architectural and design possibilities of multiple stories with lofts, vaulted ceilings, etc. Simply put, it is more expensive to build outward than it is to build upward. For every square foot of living space you build outward, you will be adding to the roof and foundation costs. These cost savings could be applied to the purchase of your residential elevator. As an authorized State certified elevator company, we have experience in servicing a variety of different elevators. We only recommend manufacturers that we have found offer superior products and excellent customer service. We proudly work with such industry leaders as Inclinator, Savaria , Smartrise, Bore-Max, Swiss Dane and Innovations Industries.